What if the place you called “home” happened to be a funeral home? Kate Mayfield explores what it meant to be the daughter of a small-town undertaker in this fascinating memoir evocative of Six Feet Under and The Help, with a hint of Mary Roach’s Stiff. The first time I touched a dead person, I was too short to reach into the casket, so my father picked me up and I leaned in for that first, empty, cold touch. It was thrilling, because it was an unthinkable act. After Kate Mayfield was born, she was taken directly to a funeral home. Her father was an undertaker, and for thirteen years the family resided in a place nearly synonymous with death. A place where the living and the dead entered their house like a vapor. The place where Kate would spend the entirety of her childhood. In a memoir that reads like a Harper Lee novel, Mayfield draws the reader into a world of Southern mystique and ghosts. 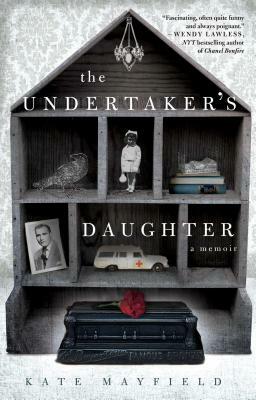 In The Undertaker’s Daughter, Kate has written a triumph of a memoir. This vivid and stranger-than-fiction true story ultimately teaches us how living in a house of death can prepare one for life. "Mayfield's depiction of her Southern Gothic childhood, with its dark corners and eccentric characters, is fascinating, often quite funny and always poignant. I rooted for her from the start." “The Undertaker's Daughter is a wonderfully quirky, gem of a book beautifully written by Kate Mayfield…. Her compelling, complicated family and cast of characters stay with you long after you close the book."